Jack has saved Private Duff’s life ‘more times than I care to think about’. The pair has been working together for 18 months, as part of Operation Herrick in Afghanistan. Having been donated to the Defence Animal Centre in Melton Mowbray, Leicestershire, the six-year-old English springer spaniel underwent 15 weeks of ‘rigorous and intensive’ initial search training involving physical fitness, obedience and tests with distractions such as smoke and heat. 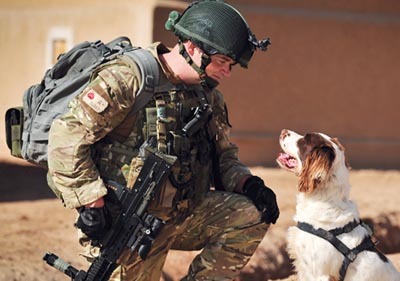 Dogs aren’t bred specifically to work with the army, often starting off as working stock before owners or trainers spot their potential and get in contact with the centre. Most of the dogs are traditional gundog breeds-mainly labradors and spaniels-valued for their intelligence and keen attitude. Private Duff now describes them as ‘inseparable-once, we were searching a compound in North Helmand that we had patrolled past many times previously. Jack told me that he’d found something, right under where I was about to step. To this day I am certain that he saved my life and those around me. I trust him implicitly’.